King David — a prolific figure throughout a good portion of the Old Testament who God used to lead His chosen people. But what if David’s prosperity didn’t come from his strength or power, and instead, an acceptance of inadequacy? Dr. Dharius Morshun Daniels thinks so. 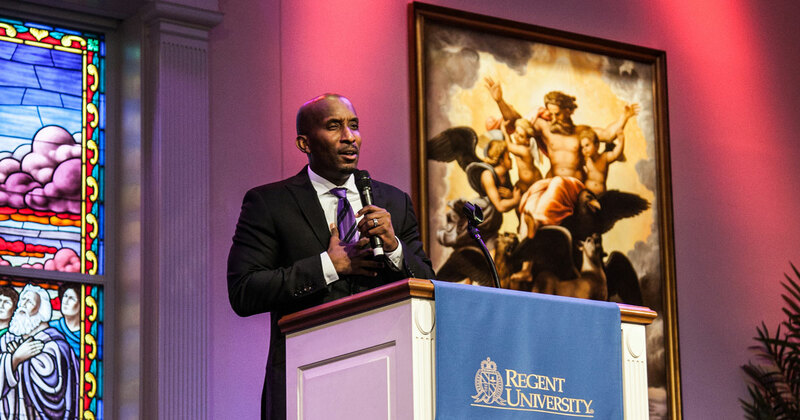 On Wednesday, February 7, Daniels gave students, faculty, and staff present at University Chapel a simple yet challenging charge — to abandon the notion of control over life and surrender it to Christ. Daniels is no stranger to higher education. He has a Master of Divinity degree from Princeton Theological Seminary and obtained a Doctorate of Ministry degree from Fuller Theological Seminary. He said seasons in which we relinquish control are full of ambiguity. However, surrendering our will to God’s, he said, puts us under his control. It’s from this place of submission that we can live as he intended. In Psalm 23, Daniels believes David articulates the blessings a believer submitted to Christ lives in, painting a resounding picture of such a life. “Control won’t lead you to green pastures and it will not lead you to still waters,” said Daniels. “I’m not advocating apathy in any sense, but I am trying to free us from the illusion that we are responsible for more than we’re actually responsible for,” Daniels added. Daniels pointed to King David as a prime example of someone who, “knew how to embrace ambiguity, who knew it was ok to have a plan and to allow God to wreck it,” said Daniels. It was because of the simple courage to trust God with his life — not by hustling, fighting to direct the course of his life, or any act on his own behalf — that God carried David, through a series of supernatural occurrences he ordained, from his victory over Goliath as a humble shepherd boy to becoming ruler of Israel. “I think when it was all over, I’m sure as David reflects on his life, he’s probably glad that somebody besides him was leading it, ordering his steps,” Daniels said.